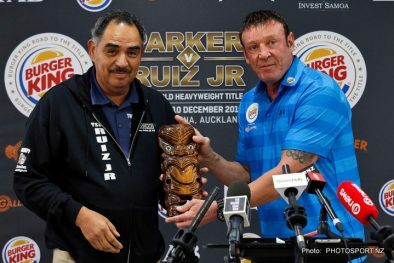 Undefeated heavyweight contenders JOE PARKER (21-0, 18 KOs), of Auckland, and ANDY RUIZ, JR. (29-0, 19 KOs), of Mexicali, Mexico, world-rated No. 1 and No. 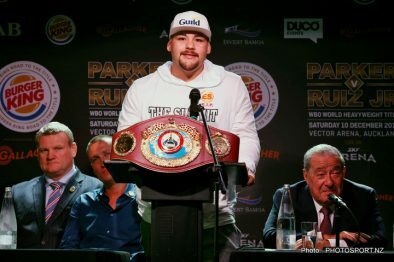 3 by the World Boxing Organization (WBO) respectively, will be battling for the vacant WBO heavyweight world title on Saturday. The fight will be televised in the U.S. on a same-day delay opening the HBO World Championship Boxing® telecast at 9:35 p.m. ET/PT, followed by the live telecast from CenturyLink Center Omaha, featuring the 10-round NABF/NABO lightweight championship fight between Top-10 contenders RAY BELTRAN (31-7-1, 19 KOs), of Phoenix, AZ, and MASON MANARD (32-1, 24 KOs), of Rayne, LA, and the Main Event, undefeated WBO/ World Boxing Council (WBC) / Ring magazine junior welterweight champion TERENCE “Bud” CRAWFORD (29-0, 20 KOs), of Omaha, Neb., defending his titles against No. 1 contender JOHN MOLINA JR. (29-6, 23 KOs), of Covin, Calif. This will be Crawford’s first defense of his unified titles and his third televised world chmpionhip fight of 2016. 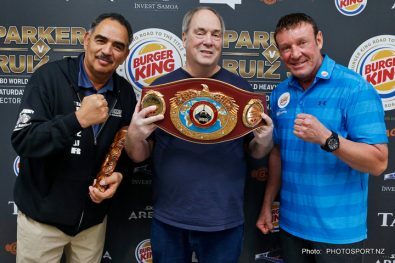 Below are the comments from Parker, Ruiz and their teams from their final press conference, as reported by intrepid publicist Ed “Kiwi” Keenan, who is on the scene. Bob, who would you put your money on? “I don’t put money on fights. I do give Andy a great chance to win this fight. I always tell people, the best way to lose money is to bet on a fight. “Andy is in sensational shape for this fight. “Andy has the fastest hands in a heavyweight that I have seen since Muhammad Ali. And he really stands in there and takes the fight to his opponent. The winner of this fight will be the preeminent heavyweight. “The competition in the heavyweight division will be great in the years to come and these two will lead it. 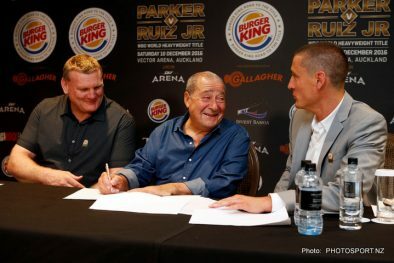 Ruiz and Parker will help make the heavyweight division the premier division in boxing. “We have two guys here that are the future of the heavyweight division. They will show us the way heavyweights are supposed to fight like. I am on a streak but that was Russia and this is New Zealand so we have to start a new streak. “Andy lost 35 pounds and it wasn’t plastics or diet. We ran a gym that made him work hard. And he lost the weight a little bit at a time. The guys in my camp weigh in every day, and they each need to be at same weight or less than they were the day before. So I can tell when they are cheating – eventually it catches up to them. ‘There are 68 world champions out there and all of their coaches are geniuses. “Key improvements are up here (pointing to his head). He has skills already. My job is to get him mentally prepared to fight. “The guy that can impose his will to win. Andy is very confident. The game plan will come after imposing his will. :”There are different ways to lose weight. When you lose the weight you become a sharper puncher. You may lose a little power but gain sharpness. “Heavy work was don in camp – right now we just wait for the fight. These two guys could fight tomorrow if they needed to. “We sparred eight 4-minute rounds every day that was the hard part and Andy did 11 the day before I left for Russia. Andy is in the best shape of his life. 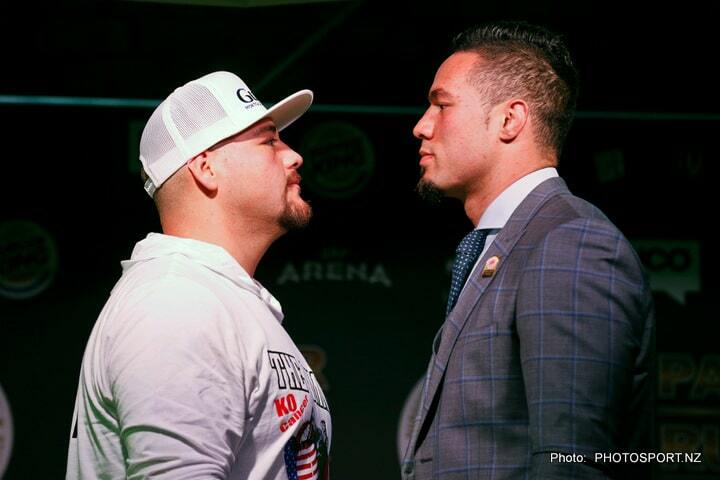 “I think Saturday is a tough 12-round fight. We are going to have a fight where they hurt each other. Heavyweights recently have been wrestling. This is going to be a real fight. I know I am going to have to work a full 12 rounds also as well as I know Kevin will too. 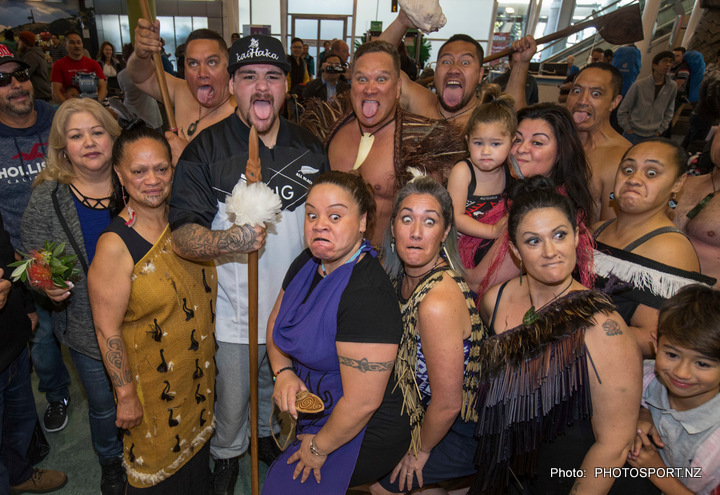 “This is my chance and I didn’t come all the way to New Zealand to lose. I know everyone is underestimating me. I know I trained hard for this fight. I hear everyone commenting on how I look physically, but imagine now that I am in great shape, how good I will be on Saturday night. I know I am an exciting fighter – I will use lots of footwork and throw a lot of combinations – and we both hit hard. Does Parker have more pressure on him since he’s fighting at home? “I know we are both prepped for 12 rounds. I don’t talk a lot of trash or anything. But when the bell rings we both flip the switch. I have a family to feed and I fight for them. 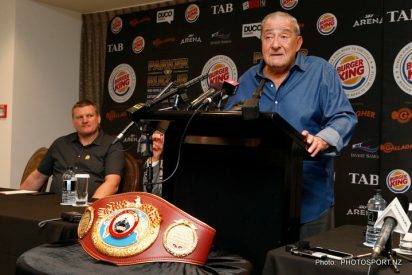 “There are two nights to go until the fight and I am very excited for the fight and excited to have it in New Zealand. 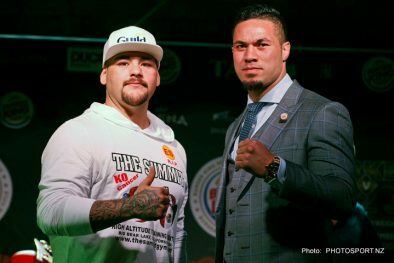 We are not underestimating Andy Ruiz. We know he is in great shape. We both know that we are in great shape and we each know each other’s strengths and weaknesses. “Yes, we did spar together. I was in Las Vegas and new to the sport. 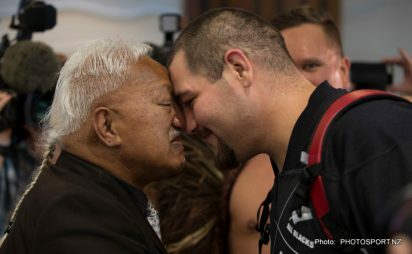 I went in to spar with him [Ruiz] and thought it would be easy because of his size but when we were sparring he hit me pretty good and he chased me out of the ring and now I have to get him back for that. He’s coming to my backyard. I have to defend my country’s honor. “We use the same routine for this fight as all the others – it is the one that has always worked. “I will use the support in the building to motivate me and that will drive me throughout the fight. 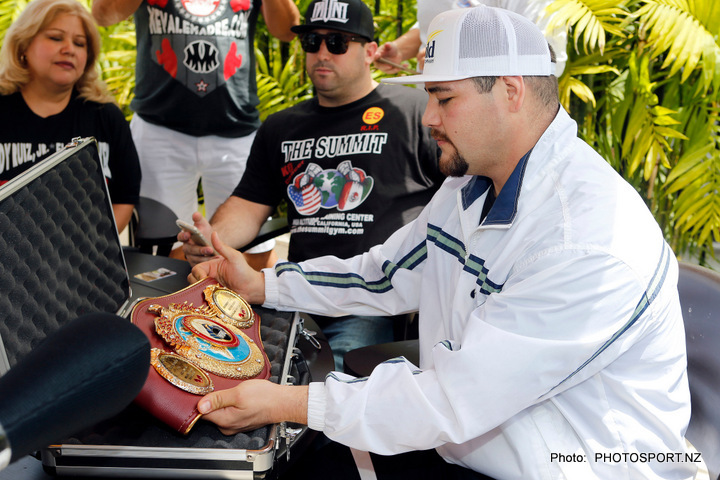 “Andy wants to take the belt back with him and I want to keep it here. I want to go out there and win this and win it well.